The election of Donald Trump sent a shock wave throughout the continent. His harsh rhetoric, while impermissible to some, without a doubt had measurable results. A great decline in border crossings started in November of 2016, reaching record low numbers upon Trump’s inauguration. However, this effect could not last forever. Bold talk can only carry one so far once the game begins. Closing in on two years in office, strong campaign speeches have diminishing effects without being turned into action. Having yet to accomplish substantial immigration reform, the aura of Trump evidently is no longer the deterrent it was upon his initial entry into office. 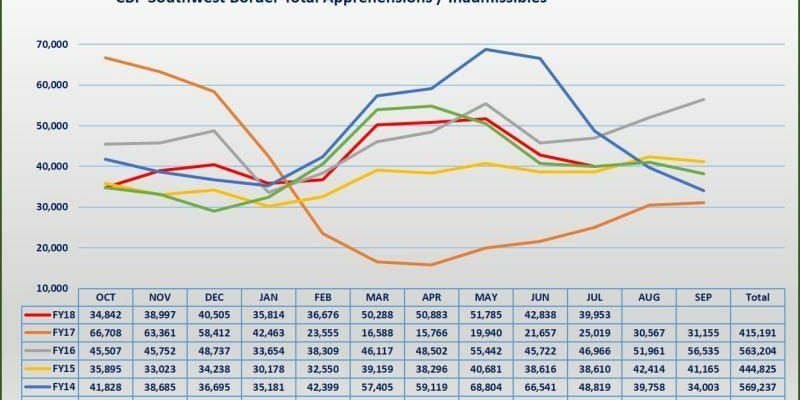 Every month for the last six months has seen substantially higher border apprehensions than this time in 2017. From February through July 2018, each month has seen at least 13,121 and as much as 35,117 more apprehensions/inadmissibles than last year. In total, there has been 272,423 apprehensions/inadmissibles in this six month time frame alone. This is over a 122% increase from 2017, which comparatively had just 122,525 such border encounters. Such a sustained rise can have one safely presume that the southwest border is back to the status quo of previous years. Every single one of these apprehensions must be processed at the American taxpayer expense. Many of these individuals will go on to remain within the country for indefinite periods of time. For perspective, in these six months of 2018, there was an average of over 1,500 such encounters a day, thus over 62 an hour, and over 1 per minute. For those Americans that may have an eye on the wall hung clock during a hard day’s work at the office, these are not just minutes that are passing. Instead, Americans are counting the number of aliens attempting to illegally cross the southern border. This clock unfortunately is not sophisticated enough to count those that happened to evade border security. Maybe that is a decent idea for next year’s model. Employers could place an order for a clock with a special extra hand to account for this discrepancy. Whether or not this new norm for the American project is going to change is yet to be seen. Many Americans voted for the current President primarily to address such issues with the immigration system. Many others are advocating for maintaining and even widening the open doors policy that has evolved over the years. The future of America is at a crossroads, and every indecisive moment that passes inches the nation closer and closer to the latter of these political futures.